My friend recently requested more appetizer recipes, and I aim to please. Appetizers and I have a complicated relationship. Or maybe dysfunctional is the word I am looking for? 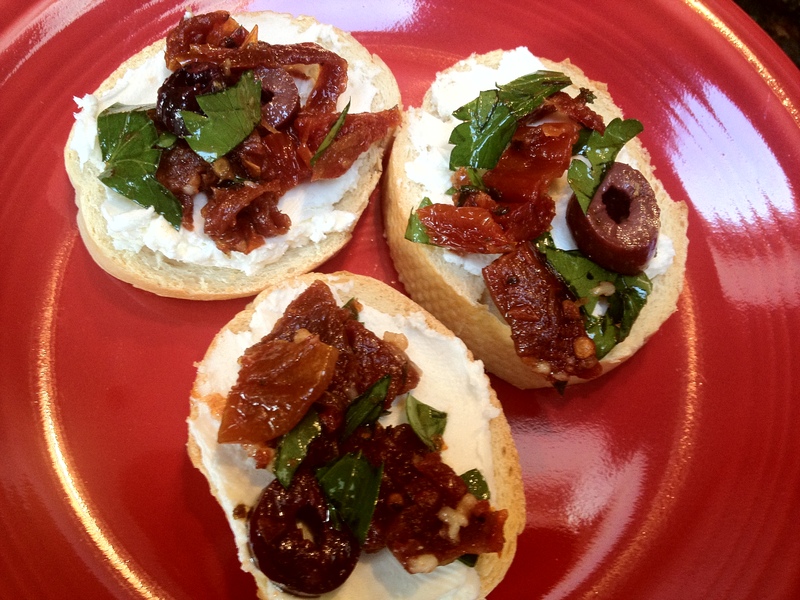 Everyone loves appetizers — myself included — but as a hostess, I have to stop myself from yelling to guests, “ENOUGH! You will spoil your appetite!” I have also been the guest who has had trouble resisting the appetizers, only to have dinner roll around and quietly think, “Oy, I’m so full. I sure wish I didn’t have to eat more food right now.” But let’s assume you and your friends possess a healthy adult-level of self control. If that is the case, I highly recommend this recipe. And if it’s not the case? Well, you’ve been warned. My friend Susie shared this recipe with me back in 1999, and I’ve been making it every year since. It is perfect for the holidays with its red and green color. There are certain old millennium aspects of this recipe (dried tomatoes, canned black olives) that I’ve modified, but feel free to stick to the original if you prefer. I usually make the cream cheese/feta mixture and the tomato/olive mixture ahead of time, but I am a little obsessive like that. This entry was posted in Appetizers and tagged Festive Crostini, Southern Living by Mom Mom's Apron. Bookmark the permalink.